Strangely the Payara (Hydrolycus Armatus, H. Scomberoides,) is a fish that has been pursued more with Rapalas, plugs and other artificial lures than with flies. If we compare the number of people who have flyfished for them with success with the number of people who have fished for them on spinning or casting, we might think this fish won’t fall that much for a lure made out of feathers and artificial hairs. The truth is it attracts their attention pretty much! It’s just a task that hasn’t been entirely done. 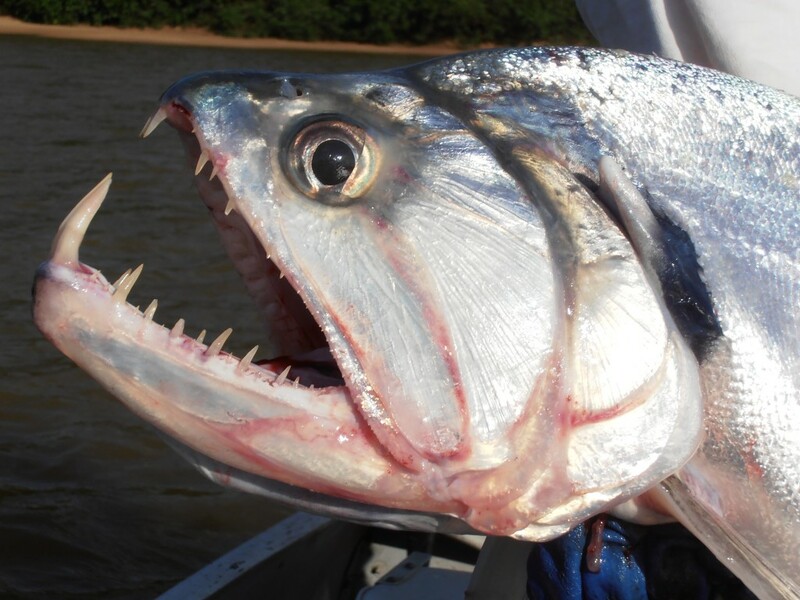 The Payara is an agressive fish that attacks the fly with amazing strength and speed, it jumps and runs with extremely violent and spectacular displays of power. A fish that stands out above all others by it's physical characteristics, a silvered fusiform body that denotes strength, a wide tail which transalates into speed and power, and above all, large jaws with the most impressive fangs you could ever see which are the main characteristic of the species. They can reach a weight of 40+ pounds, though fish between 15 and 25 pounds are the most common. They are obvious carnivores, their toothy jaws with pointy teeth of about an inch in length and two tusks of up to 3 inches long confirms it. In it's evolution they developed the ability to change forever their teeth whenever they crash them when they attack armored fish such as catfish species (Silurids) or some plecos fish (Loricarids). They will also attack turtles and birds! They inhabit all the tributaries of the Colombian Orinoco and Amazon basins, prey on each and every fish around. Never uncommon to see schools of prey fish breaking the surface jumping all over the place while escaping an attack. 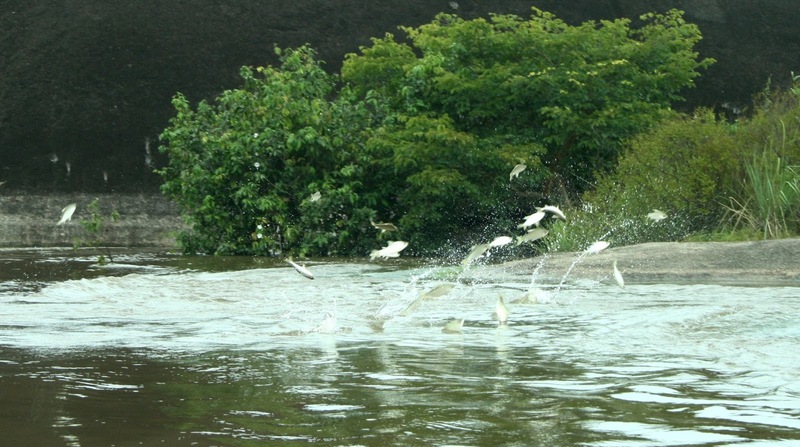 Banks: At the end of the rainy season, flooded savannahs begin to drain down creating waterfalls into the river carrying out large amounts of food into it concentrating all kinds of fish. The waters which have not yet fully clarified promote some pretty aggressive hunts. If you can see your hand at about 16 inches deep, then the conditions to work this area are given. Find water 3 feet to 10 feet deep with medium to fast currents, work the fly along structures such as rocks, logs and dark holes in the bank. If you see no activity but you see that rocks in the bank walls are wet then you better start working, this means they are around and have being shacking some water and prey. In mouths of creeks, rivers and lagoons: remember that everything draining out favors them. Most mouths of streams and creeks offer good fishing as far as it goes into the dry season. The lagoon mouths are very good at the beginning of the season because of the amount of water they supply to the river before drying out. This places concentrate Payara schools that generally won’t exceed the 8 pound range (fun size!) although it is not uncommon to find specimens of larger size. Deep pools: Payaras generally move into deeper water as temperature rises during the day, they will return to the shallows as the temperature lowers in the afternoon and night. Fishing changes here, you must get your fly down, most pools are 10 to 30 feet deep. You might want to work the column efficiently by trying different depths, bigger ones usually stay down. Strong currents, their anatomy allows them to hunt in such waters, this are the most difficult waters to fish, they will stay down with their bellies on the gravel to save energy and will rise up to swallow any fish compromised by the current. Mending your line with heavy flies will entice them to strike, but it will be hard to get that hook in their bony mouth as the slacks in the line sometimes won’t let you strike immediately. Whenever you see them reluctant to take the fly while returning to the depths in their characteristic arch movement, change your flies and strip faster. Try the exact opposite of what you are using, for example if it’s a medium sized fly in dark colors, tie a larger one with lots of flash in lighter colors, change your stripping! Usually working the fly faster will do the trick. A full moon allows us to catch them late into the night with a floating or an intermediate line. Lower temps will pull them up to hunt the river banks and any other structures as their visibility increases with the moon light. Moving water flies such as Dahlberg divers or Reducers are a clever choice. 8 to 10 weight fast action rods are recommended. Big flies are needed for this fish, so the rod of your preference will depend on your casting skills. A quality reel with a smooth drag, capable of holding at least 150 yds of backing will complete your set up. Gloves or stripping finger protection is always a wise choice, heat will dry the line and fingers and fast runs of the fish or even stripping can easily cut through your skin. Due to the environment, tropical lines are a must! Different conditions will be present during a fishing trip for payaras, you might find them along drop-offs in the beaches, cruising flats, along steep banks, in fast running waters or deep pools. RIO tropical lines make choices an easy thing for such varied scenarios. Tropical Outbound short lines in floating and floating/intermediate tips will cover all ranges of “shallow” depths. Very long casts are easy to make whenever the situation calls for it, handling wind resistant flies with accuracy is never an issue. Payaras are not leader shy. Whether you tie your own or purchase pre-tied leaders RIO has some nice products. 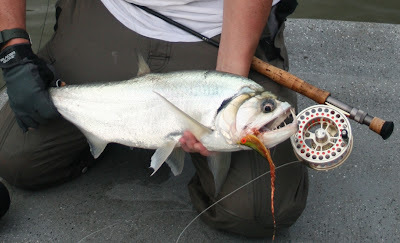 A shock tippet, due to the toothy mouth of this fish is a must. RIO’s Toothy Critter leaders with nylon coated wire shocks in 15 lbs to 30 lbs will do the job. If you like to tie your own, RIO’s Hard Alloy SW mono and RIO’s Powerflex Wire Bite Tippet are the best choice to customize the length and strength of your leaders. As a rule of thumb, 6 to 7.5 ft leaders for floating and intermediate lines will help you cast and work the fly efficiently. 3 to 5 ft leaders for sink tip lines will help you get the fly deep faster. There is just one way to go, BIG, or even HUGE! Several patterns tied on short shank or long shank 3/0 to 5/0 hooks will work as long as they are large and feature a big profile. Bait fish patterns in white/chartreuse, white/blue, white/black, red/yellow, black/purple, black/brown colors with lots of flash are always a good choice. Deceivers, Reducers, Beadles billfish flies, EP big eyes, Mega mushies etc, are all effective for payara. Large Clouser minnows, Half n´ Halfs and Whistlers will be useful as well. There is no need for tandem hook flies, experience has shown that even short shank hooks provide solid hook-ups as payara attack their prey in the forward portion of the body. They will stab first and then they will swallow. Don’t forget poppers, as they are so useful and a lot of fun to see whenever there is surface action. Early in the morning, late in the afternoon or even in full moon nights working poppers on a tropical Outbound line will make them crazy! Make sure you have plenty of poppers, those teeth are never forgiving. - Setting the hook in this fish mouth is tricky so there should be no finesse, a strong, repeated strip strike, just as it’s done in tarpon fishing will improve your chances. After that, be prepared to clear your line as it gets to the reel. Fast runs, jumps and even tail walking will keep you busy for a while. - Always keep a tight line and be prepared for sudden movements, they will sometimes charge towards you, reel in! They’ll turn around, jump and run again. -Turn their heads!! Don’t be afraid to apply high amounts of pressure to the fish, even in fast currents. That will reduce the fight time and improve the chances for a fast and safe release. - It’s wise to use a net or a fish cradle to handle them, if you don’t have one, this fish provides a firm grip at their tails just like salmon do keeping their head away from you. Avoid rising them from the tail, their organs will suffer bad injuries, it is best if you handle them in the water. - Watch out for those teeth while removing the fly, you’ll probably realize that as you look into it though. Hold the fish firmly and use your pliers. - Barbless hooks will make it easier to release the fish fast and keep you safe. It’s impossible to resist taking pictures of this fish and such fangs, just hold them horizontally to take the pic, keep them in the water in between shots. - Swish it back and forth in the water before releasing, make sure it’s ready and let go! LET'S KEEP THE WATERS ALIVE!! 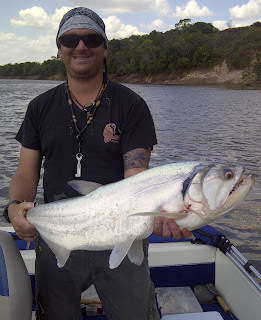 Have awesome trip in vacations to Venezuela for getting all the tips for payara fishing in laguna larga lodge. Excelente articulo, felicitaciones lo detallado y claro. Me ha servido mucho, gracias ! Me alegra mucho que le sirva Jonathan!